Pink Dragon Fruit or Pitaya is a fruit with a lot of health benefits. Including them as a part of our daily diet is good for our health. This post is about some of my knowledge on this fruit and with a sweet recipe using this fruit. 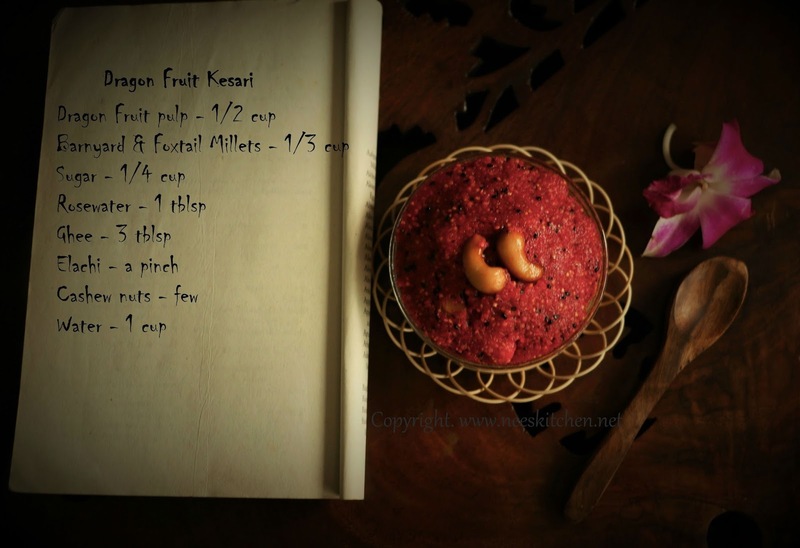 Pink flesh dragon fruit cooked in ghee along with roasted & powdered millets, sugar , cardamom ,garnished with Cashew nuts and finally flavored with rose water gives you this yummy and pinky "Dragon Fruit Kesari". I have never seen this fruit until I came to Singapore around 10 years back, however I am seeing this fruit in Chennai in some shops these days. First time I saw I was carried away by its outer look but never dared to try it as I was told that it doesn’t have any taste. After almost a year I decided to give a try as I keep seeing this fruit almost in every grocery shop. Now this fruit is a part of my regular diet like how we consume banana in India. I somehow still do not enjoy the taste of the white pulp dragon fruit but I just love the pink one’s as they are sweet. From the outer cover color there is no difference , however the shape of the red flesh dragon fruit is round while the white ones are oval. The seeds inside the fruit cannot be thrown and must be chewed very nicely to get the maximum benefits. The seeds must be chewed nicely else they wont get digested. They give a natural nutty taste & color when added in any dishes. Coming back to the recipe, I have added rose water because the fruit as such do not have a flavor even though this pink variety is sweeter. I have tried other flavors like kesar earlier but I felt rose flavor suited well for this recipe. Lastly, I named it as kesari as this is almost like making traditional kesari except with the difference that the final dish is a bit coarse as we have the seeds & millets added. You can feel this recipe a nutty & rose flavored while tasting it. Try this out and let me know if you liked it. 1. Cut the dragon fruit into half. We actually need less than ½ for a ½ cup pulp. 2. Scoop it out and chop them into big chunks. 3. Grind them without adding any water. You will see the seeds still visible, it is just fine as we need that nutty flavor in the final dish. There should not be any chunks of dragon fruit left out. Use only the measurements given in the ingredients list for the pulp. 4. Take a non-stick pan and dry roast the mixed millets until a nice aroma comes. Allow it to cool. 5. Add them in the mixer and blending it into coarse powder consistency. It need not reach the sooji rava consistency. 6. Take the non-stick pan and in medium flame gas , add ½ tblsp ghee and roast the cashew nuts. 7. Once roasted, take the cashew nuts and keep it separately. 8. In the same pan, add dragon fruit pulp first and then water and let it boil. 9. Once it boils, reduce the gas to low flame and add the millets and keep stirring continuously without forming lumps. 10. Once it becomes thick and the millets are cooked add elachi powder, sugar and give it a mix. 11. At this stage you might see some water coming but it is still fine the dish will get thicker. 12. Once the sugar is mixed and melted add cashew nuts and ghee around 2 ½ tblsp. The spoon I used in the picture is a small one so I added the ghee 5 times to get the 2 ½ tblsp measurement. 13. Lastly add the rose water and give a mix. Switch off the gas. The pink dragon fruit is a mild sweet by itself so make sure you adjust the sugar quantity as per your taste. The measurement give above is just fine for us. The black nuts is very difficult to be crushed and its tastier to keep it as it is. Hence do not worry if you see the black nuts. I have added brown sugar but you may add the normal white sugar. The pink dragon fruit would spread color through-out while cutting or handling, so you may prefer to handle it accordingly. However it is easily washable. You may wish to double up the rose water quantity if you love the smell. You may roast the millets in ghee instead of dry roast, in that case increase the quantity of ghee. Refer to the recipe at "Dragon Fruit Millets Kesari"